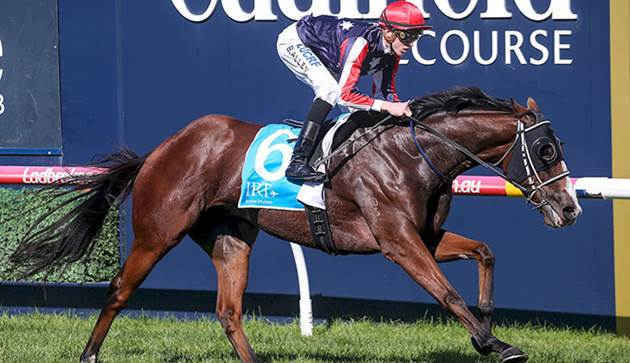 The Mill Park Raised Waging War missed his big chance at a Group 1 a year ago when he was scratched at the barriers in the South Australian Derby, but few who saw him win first-up on Saturday at Caulfield would doubt that more such chances lay in the horse's future. Starting at $8.50, Waging War sat second-last in the field of seven in the VOBIS Gold Mile but then extended to run away from his rivals and have a three-length margin over the $3.50 favourite Widgee Turf, with Sword Of Light ($4.40) in third place. Jockey Ben Allen said felt the horse was in for a big campaign as he too was surprised with the way he let down after turning for home. "That was huge and to sprint away from a field like that shows he's in for a big prep," Allen said. Waging War is bred to stay being by co-trainer Leon Macdonald's Victoria Derby winner Rebel Raider out of a Galileo mare. In 15 starts he has now won six times and Saturday's winning prize of $137,500 saw his earnings top $300,000. Saddling up the four-year-old was Macdonald's former right-hand man Andrew Noblet, who trains in his own right at Caulfield. He said the SA veteran had told him the horse was going well and that he had a good opinion of him as a stayer but was worried that the weight scale - which saw him carry the same weight as the likes of favourite Widgee Turf and So Si Bon - might play against him.